There are two types of cell division: mitosis and meiosis. Most of the time when people refer to “cell division,” they mean mitosis, the process of making new body cells. Meiosis is the type of cell division that creates egg and sperm cells. Mitosis is a fundamental process for life. During mitosis, a cell duplicates all of its contents, including its chromosomes, and splits to form two identical daughter cells. Because this process is so critical, the steps of mitosis are carefully controlled by a number of genes. When mitosis is not regulated correctly, health problems such as cancer can result. The other type of cell division, meiosis, ensures that humans have the same number of chromosomes in each generation. It is a two-step process that reduces the chromosome number by half—from 46 to 23—to form sperm and egg cells. When the sperm and egg cells unite at conception, each contributes 23 chromosomes so the resulting embryo will have the usual 46. 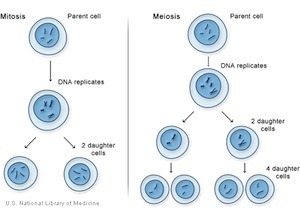 Meiosis also allows genetic variation through a process of DNA shuffling while the cells are dividing.